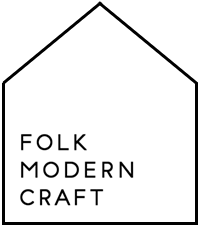 WELCOME TO FOLK MODERN CRAFT, A SEWING STUDIO & RESOURCE FOR MAKERS WITH A CONTEMPORARY AESTHETIC. MY PRIVATE SEWING STUDIO IS LOCATED IN SANTA ROSA WHERE I OFFER SEWING CLASSES FOR KIDS AND WORK INDEPENDENTLY ON MY OWN PROJECTS. A WELL DESIGNED IMPLEMENT REALLY DOES ENHANCE THE CREATIVE PROCESS, WHICH IS WHY I HAVE CHOSEN TO SHOWCASE A SMALL UNIQUE SELECTION HERE ONLINE. BROWSE SOME OF MY FAVORITE INDEPENDENTLY DESIGNED PIECES AND ENJOY THE PRACTICE & PROGRESS OF YOUR OWN MAKING. PLEASE EMAIL ME IF YOU HAVE ANY QUESTIONS REGARDING THE KIDS SEWING CLASSES OR SPECIFIC PRODUCTS.